An alternative to the dining options available at the airport. Green King tied pub, so the beers weren't massively inspiring. The Old Speckled Hen was ropey, so I moved to the San Miguel. Mainly to get some practice for when in Spain. Food was very good - great portions and reasonable price. I had lunch here recently. The a la carte menus are extraordinary; heavy boards with pages bolted on in such a way as to prevent easy browsing. There's even a miniature reading lamp attached to each menu! The snack menus are also eccentric being formed out of curved plastic and both provided equal quantities of irritation and amusement. When the meals arrived, the fish and chips looked great. My baked potato with cheese (apparently) and beans came on a cold plate, accompanied by potato salad, some yellowing cress and a few more conventional items of salad. The staff were pleasant. Will I be going back? Not unless dragged. 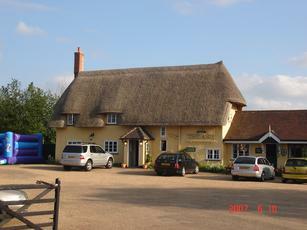 Country pub nestling against the perimeter fence of Stansted Airport. Extended, extensive, restaurant area. As with most country pubs in this area the focus is on food but the original bar area has been kept as a haven for drinkers. Usually has a choice of real ales. 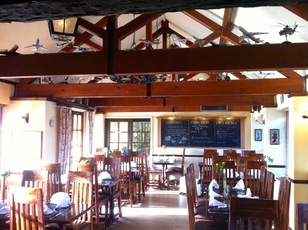 Large outside seating area, with children's play area, ideal for plane watching.